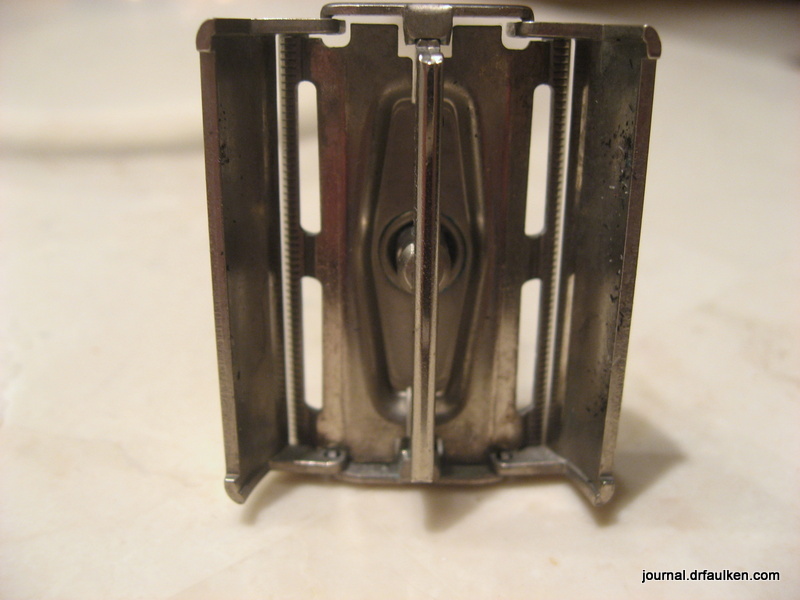 Almost all of my double-edged safety razors are vintage. They’ve come in various states of condition, varying from “this is used?” to “this is used.” I don’t know who the previous owner(s) were. I’m a little squicked out about putting something that held a razor blade close to the face of a stranger up against my face. 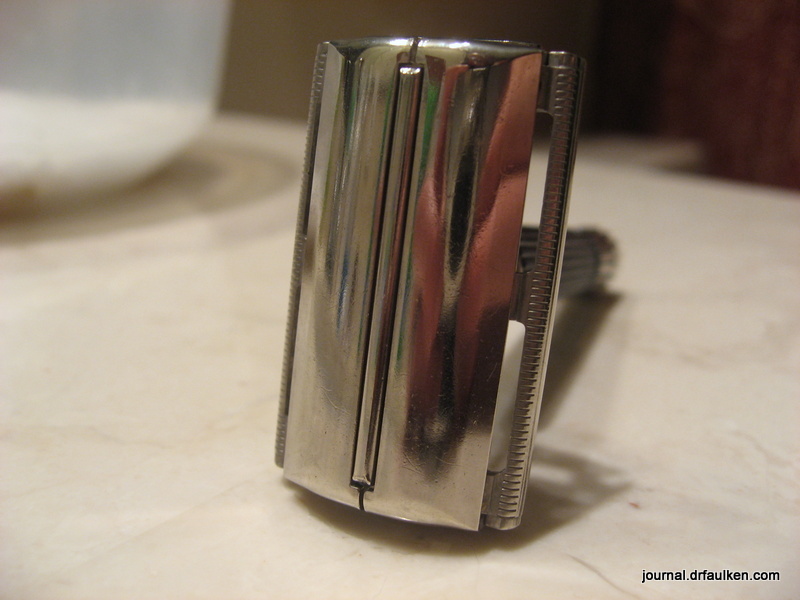 Some collectors of razors use Barbicide. This is partially due to the disinfecting properties of the liquid, but also because anyone who’s been to an American barber or stylist recognizes the signature blue tint and nifty containers. Barbicide isn’t super spendy, but it’s more expensive than what I need for an occasional disinfecting and cleaning. I started looking for alternatives, and quite a few vintage razor collectors use Scrubbing Bubbles Bathroom Cleaner by SC Johnson. The active ingredient in Barbicide is Alkyl dimethyl benzyl ammonium chloride (ADBAC), which according to Wikipedia is at 5.12% by volume. 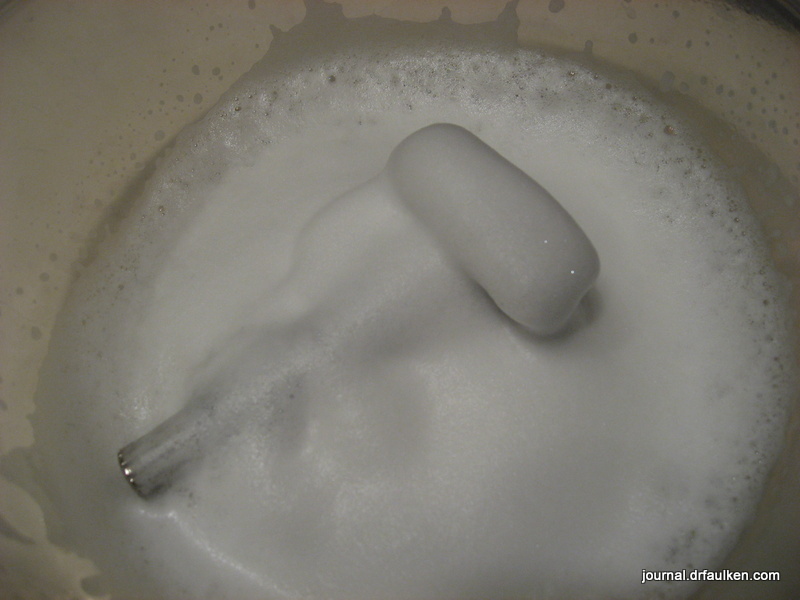 Scrubbing Bubbles also has ADBAC, and is strong enough to take out any blood-born viruses or bacteria that a razor may come into contact with. It helps clean stuff, too. 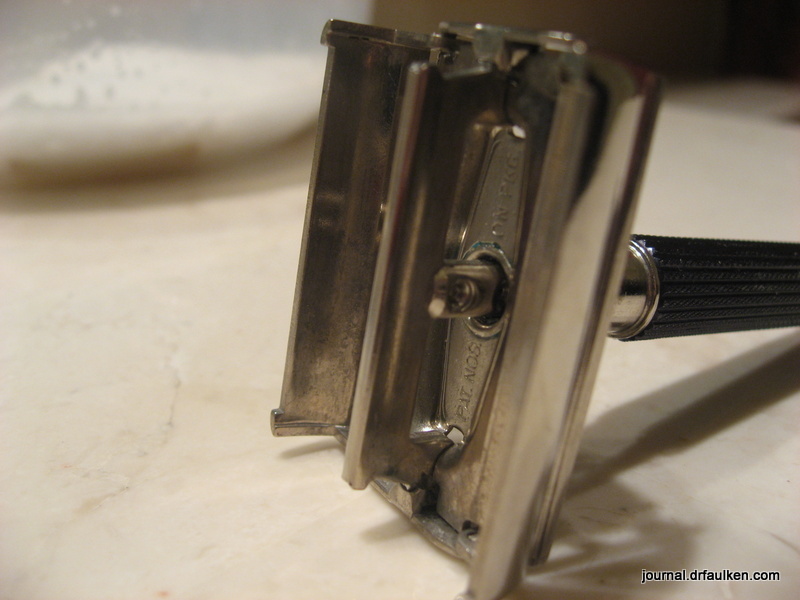 Here’s my Gillette Super Speed double edge safety razor. This is after a typical cursory rinse. There’s some hair left, but the real focus here is the residual soap muck left over from the Arko shaving soap I use. Using Scrubbing Bubbles is simple. Get a non-reactive container big enough to hold your razor. I’m using an old plastic container here. Open the razor up and spray Scrubbing Bubbles liberally over the razor. Turn the razor and spray again. Let the razor sit for about five minutes or so. The bubbles will disappear. Rinse the razor under cold water and then wipe with a clean cotton cloth. The next step, if I were doing a more complete restoration, would be to hit the tarnished areas up with MAAS. There are some environmental and safety concerns with Scrubbing Bubbles, and prolonged exposure to the chemicals within it (and Barbicide) is not recommended. That being said, at my usage levels I’m not the least bit concerned. You can buy a can of Scrubbing Bubbles for about $4 – $5 at your local big box store. There are several variants, make sure you get the bathroom cleaner foaming version. I think it’s a good alternative to Barbicide, especially if you don’t constantly disinfect your shaving equipment. If you just need to disinfect or clean vintage razors a few times a year, Scrubbing Bubbles are where it’s at. Aerobie Aeropress: The greatest coffee device ever devised?